Spring-harvested green tea from china. Offering a twist on conventional green tea, Tazo China Green Tips Green Tea delivers audacious flavor your guests and employees seek. This fresh-tasting, spring-harvested green tea is cultivated exclusively from the mountains of Zhejiang, China. While traditional Chinese tea is pan-fired, this unique blend of green teas leaves is steamed for light, delicious flavor. 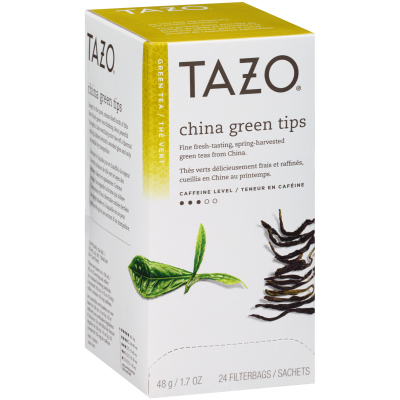 Ideal for restaurants, cafes, hotels, and office environments, this package includes six boxes of 24 individually wrapped bags of Tazo China Green Tips Green Tea. Whether you're an office manager looking to ignite the creativity of your workforce, or a café owner in search of a deliciously unique flavor offering, you will love serving this blend that captivates with every sip.